As of October 18th, 2018, new plantings of the following flammable plants are restricted within Ashland's city limits, both during new construction AND throughout the city within 30 feet of any structure, including adjacent lots. All landscaping plants can be flammable if not properly maintained and watered. This list will be reviewed yearly by the Wildfire Mitigation Commission, with changes brought to City Council for adoption in an amended Resolution as needed. *Exceptions may be granted by Ashland Fire & Rescue for dwarf or prostrate varieties of these species planted beyond 5 feet from any structure, and that follow tree or shrub spacing guidelines as defined in the General Fuel Modification Area Standards in Chapter 18.3.10.100. 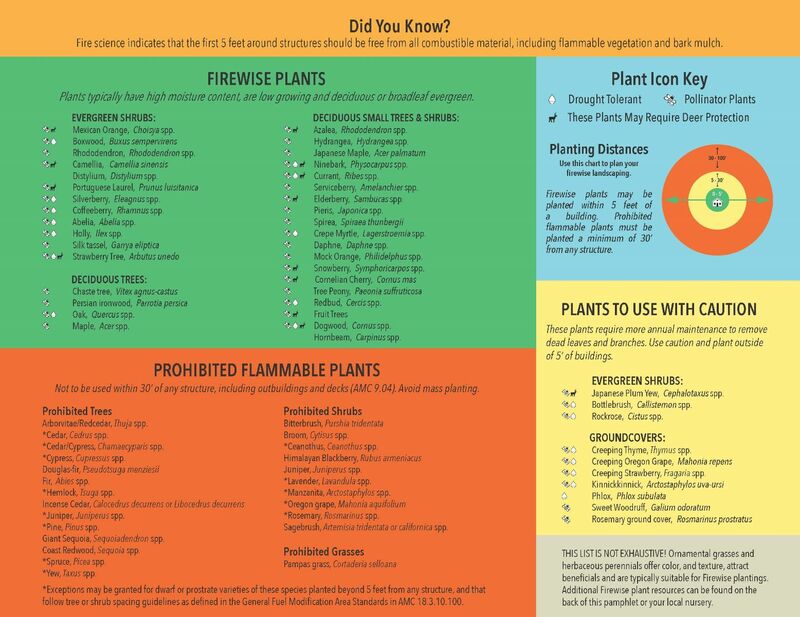 Use this printable reference for Firewise plantings.